This was a great free sample, and now they are all gone! That’s why you’ve got to request yours while it’s HOT! Get a free sample of Starbucks coffee mailed to your house (hurry, this offer will not last long!). 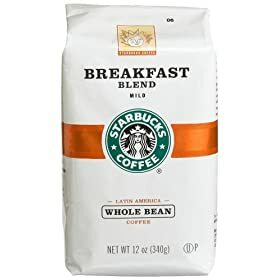 They just want to make sure you are aware that you can buy Starbucks coffee in a bag at your local grocery store! You get to choose from 4 flavors: Breakfast Blend, Caffe Verona, House Blend, or Sumatra. They will ask you 4 questions about your coffee-buying habits after you fill out the request form – you can answer these or skip them. You should receive your free java in 6 to 8 weeks. Happy brewing! 5/17/08 Update: I got my 2.5 oz. bag of Caffe Verona! Glad to hear this is the BEST freebie for you Kingdom First Mom! I’m sipping my green tea as I type this – have to remind myself that the caffeine in coffee is just a little bit too powerful for me. I am an avid coffee drinker, so I will not be talking you out of that.Thanks for this, I am more excited about this than any other freebie I signed up for. I’m glad everyone is loving FREE Starbucks! I will admit I have started considering switching from tea to coffee because I feel the need for more pick-me-up in the morning. Please talk me out of being a regular coffee-drinker, to keep it a special once-in-awhile treat (like when I get my free Starbucks in the mail). Thanks so much for finding all these great freebies!! I’ve enjoyed your blog and thanks for all the tips and ideas and coupons. I’m adding you to my frugal mommy blogs blogroll. You rock! That’s an awsome find Heather~~thanks!!! You’re welcome, Jessie! Haven’t gotten anything from Celestial Seasonings yet, but wondering if I will since I kind of messed up when I entered the UPC codes. Entered in the extra digit at beginning and ending of code – so not sure how they are screening those requests and if mine will just get kicked out. I’ll update that post when I get it! Probably some tea and a bookmark is my guess – nothing too fancy, but great for any tea drinker.